The CD duplication process allows you to create an exact copy of a CD, by burning another one with the mirror image created for the original. Thanks to the technology used, the CD’s that will be created will be exact replicas of the original CD, matching it as far as quality is concerned as well. The duplicated CD’s will receive a print which will be either thermal or inkjet. Duplicating a CD is possible through the means available to you at home, but you have to waste a lot of time if you want to create a large number of them. Duplication and replication of CD’s are two different things, though people tend to confuse them. In both cases, the result is an exact copy of a DVD or a CD, but the method is different. The CD duplication method allows you to create hundreds of CD’s in a shorter period of time. If you need more than 1000 copies, the replication method is a better choice. When you’re considering whether you should go with CD replication or duplication, you should make that decision by looking at the quality you need, at the desired turnaround time and the number of copies you need. The CD duplication method involves using a master disc, from which the data is transferred or burned, on a high quality blank disc. Once the transfer is complete, the original and the copy are compared. If the comparison shows that they’re the same, it’s accepted. The speed at which the disc is burned will vary, based on the type of data which is being copied. For example, if you’re creating a music CD the speed needs to be slower in order to keep the quality at a high level. As for the CD replication process, it involves creating the glass master for the CD, after which replicas are created based on it, made from polycarbonate. These CD’s are printed with either screen printing or offset printing machines. The CD replication method is useful mostly when you need to make a lot of copies. 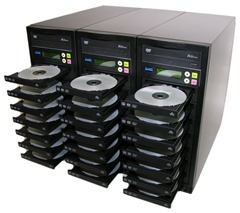 The same process used to duplicate CD’s is also used for DVD duplication. The basic technology remains the same, even though the medium that is used has changed.